Something happened recently that made me change my thinking on the practice, and also got me thinking about the similar practice of racing pigeons. The short version–regardless of whether the “dove” releasers are licensed and professional–is that there is no such thing as “ethical” dove release, or pigeon-racing. 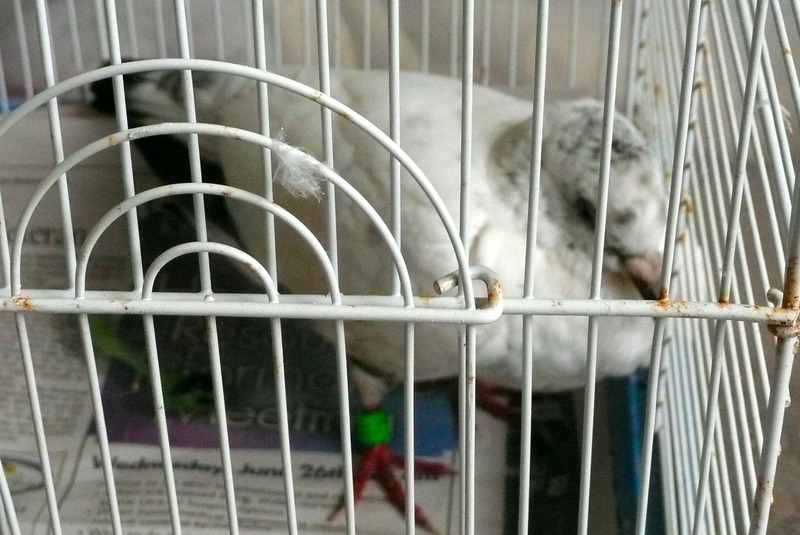 It’s a cruel way to make a profit, and, as a “sport”, pigeon-racing is unjustifiable. Here’s what happened to make me feel this way: A couple of days ago I took my dog out for a walk, and we came across a beautiful little white pigeon with a band on her leg. She was obviously sick, and unable to fly, so (as I’ve done so many times in the past) I took her in. I put her in a cage I had in a quiet room so that my dog wouldn’t bother her, and hand-fed her some water (she drank as if she hadn’t had any in days), and left some seed for her, although she didn’t look as if she was going to be able to get anything down. Her breast-bone was sticking out–a sure sign that she was sick and starving. I called around and, using the information on her band, found out that her “owner” owns a coop about 30 or 40 miles away, and that he races pigeons. I was hoping that the bird would recover, and I knew damn well that if she did there was no way I was going to send her back, only to possibly be killed (although I can’t confirm it, I’ve read that returned racing pigeons sometimes simply get their necks broken by their owners because they can’t “perform”), or sent out into the dangerous wild again. I would have given her a safe home. But I was too late–a couple of hours after I took her in, I found her rolling on the floor in agony, her head twisting around. Her beautiful gray eyes seemed to be pleading with me for help, but all I could do was pray that the suffering would stop, and tell her that I loved her and that I was sorry. It was horrible. And then she died. I found her on her back, with her wings spread out on either side. I did call the owner that night, after the pigeon had died. When I told him what happened, he said, “Oh, that’s too bad. But it’s OK–I have lots of other birds.” I responded that it was NOT “OK” with me, but he didn’t seem to get it. The bird was just a commodity–a piece of equipment for the “sport” he entertains himself with. Dove (or pigeon) release is not a “beautiful symbol of peace and whatever”–whether the birds are trained homing pigeons or not, there are still too many dangers out there. A lost bird can spend days suffering because it doesn’t know how to get food and water in the wild–and even trained pigeons get lost. And, for the same reasons, pigeon-racing is not a “sport.” The death of the little bird I found was not a fluke–she was the third casualty I’ve come across in less than three months, and there are many, many others (if you look at the “I Found a Pigeon or Dove” forum on the site to which I’m about to give you the link, you’ll get a better sense of how often it happens). And, even if you find the bird’s owner (and even if he or she offers to pick it up or have it shipped “home”), I suggest that you don’t return the bird. If you can keep it, do so (they’re amazingly smart and affectionate creatures). If not, the people on the site can help you find a home for it. THAT’S the ethical thing to do. If you’d seen, and held, the bird I’d found, you’d understand. The Kindle version of Holding Breath: A Memoir of AIDS’ Wildfire Days will be FREE starting at about midnight Pacific Time tonight, until midnight on Sunday, 9/15. At the moment, the book has a rating of 4.6 out of 5 stars from twenty customer reviews on Amazon; if you do read it, additional (honest) reviews are more than welcome! The regular price for the ebook version is $3.99.